I’ve talked before about the importance of word choices in establishing voice. So, now, you’re editing your novel and you’ve decided that this word is the right diction, has the right connotations, and sounds right. There’s one more consideration. Would you actually choose this word or did you find it by looking it up in a thesaurus? In the context of this story, is it a word you would normally choose? In other words, while you’re searching for the right words, you also need to remember that this should be your word choice, that it comes from your voice. Here, I’m stressing the need to remain true to your natural voice, while at the same time, serving the needs of the story. A tricky balancing act! Les Edgerton, in his book Finding Your Voice , suggests that if more than 5% of the words in your writing are words you wouldn’t normally use, then it’s too much. You’ve gone too far beyond your natural voice. He suggests using clustering to find words that come from your vocabulary. I first encountered clustering in Writing the Natural Way . It’s technique that tries to by-pass your left-brain editor and instead, put you in touch with the artistic-right-brain. Write a word in the center of the page and circle it. Draw lines going off the word and at the end of each line, draw another circle. Inside that circle, write a word that you associate with the central word. You can connect circles or draw multiple lines from one circle. Essentially, you’re creating a visual map of your connotations and associations for that word. Edgerton suggests you take one of the off-shoot words and repeat seven or eight times. Then compare the word-webs. Are there any words in common among the webs? Which of these words would best word in your writing. Instead of reaching for a thesaurus, reach inside your brain, inside your voice and look for the right word. Interesting technique. I’ll try it with a few words in my novel – that I feel I need to change. 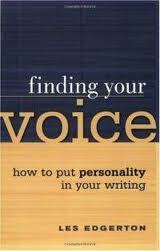 Do you think an author’s ‘voice’ is easier to establish when the novel is written in 3rd POV omniscient than in 1st POV? I was just reading this and realized it was close to an exercise I made up for myself recently. Funny how writers searching for voice and words end up at the same place. I called mine ripple charts, but they are the same association diagrams. Guess there are no new ideas, just new people finding the same ones. At least I know I’m on the right track, if someone has blazed it before me.